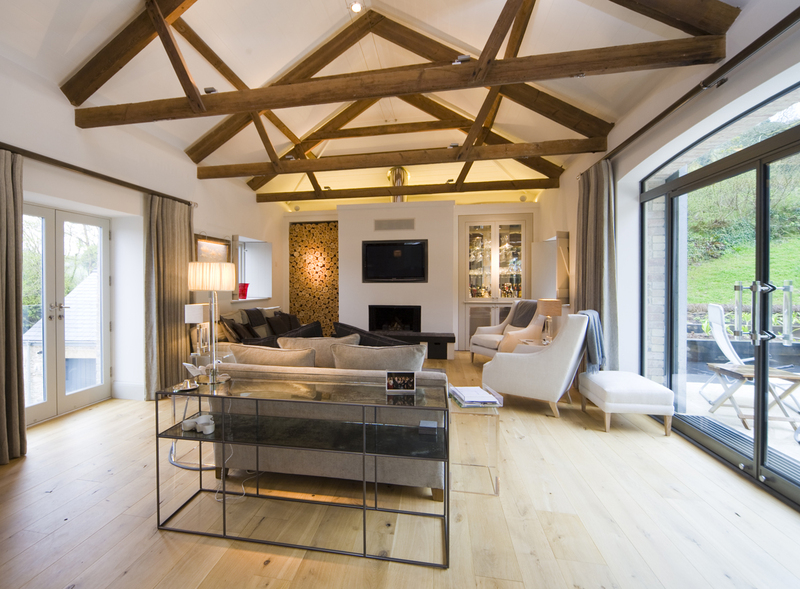 We are delighted to announce that our Design Associate Alexandra Fry’s scheme for a private barn in Devon has won the Best Lighting Project Award at the inaugural idFX Design Awards. The property on the north Devon coast was purchased as a derelict building and the client’s brief was to retain its character and charm whilst ensuring the interior reflected the latest technologies and energy efficient solutions where possible in this 18 month project. The upside down nature of the layout posed challenges and the design in both the architecture and the lighting solutions had to overcome these. Skylights were introduces into the bedrooms and lower corridor as the only source of daylight. 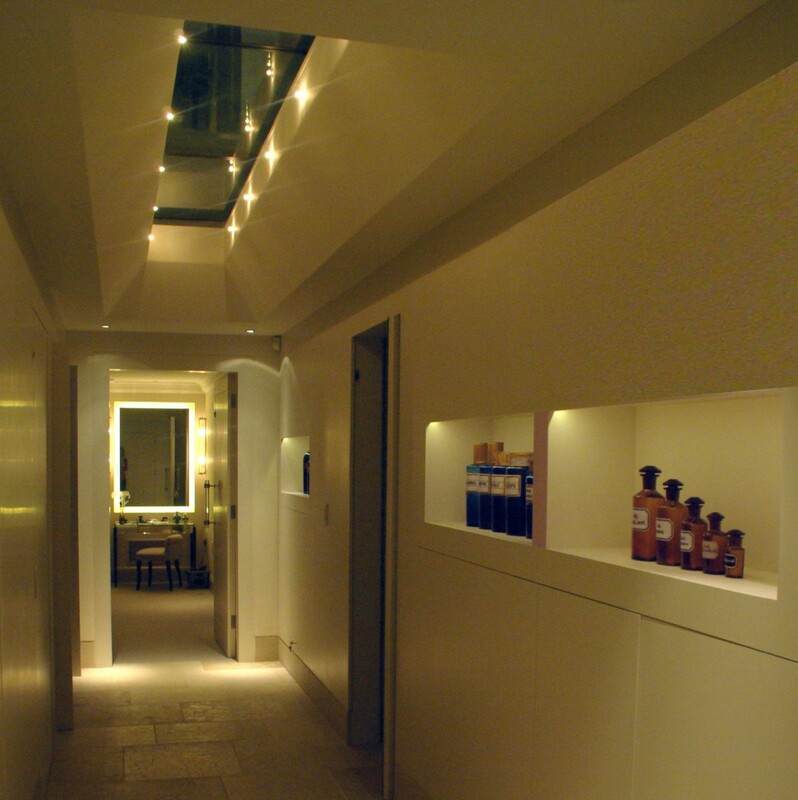 At night these are brought to life with the use of halogen Starlights to prevent the glass creating a black ceiling. Niches were introduced wherever possible to house the clients collection of object d’art and create interesting focal points throughout the space. These were lit with Streamer LED linear lighting at less than 10% of the energy consumption than traditional low voltage methods. The master ensuite lighting was designed to give a bright daylight feel during the day and be transformed to a calm welcoming space at night, combining low voltage accent downlights, niche lights and 1w LED Lucca uplights to create a sense of drama. The master dressing room with little natural daylight uses a clever combination of mirrors and crisp reflected Polestar 2010 downlight as well as low level Oslo night lights activated by a motion sensor. The main living room benefits from plenty of daylight. The room doubles as a study and on dull days the light is boosted by the use of Echo Wallwash uplights on top of the main beams as well as LED Contour linear uplights at each end. Focal points are accented by discreet surface mounted Minos 35 spotlights on the sides of the beams. The kitchen’s pitched and beamed ceiling meant that downlights were not appropriate. 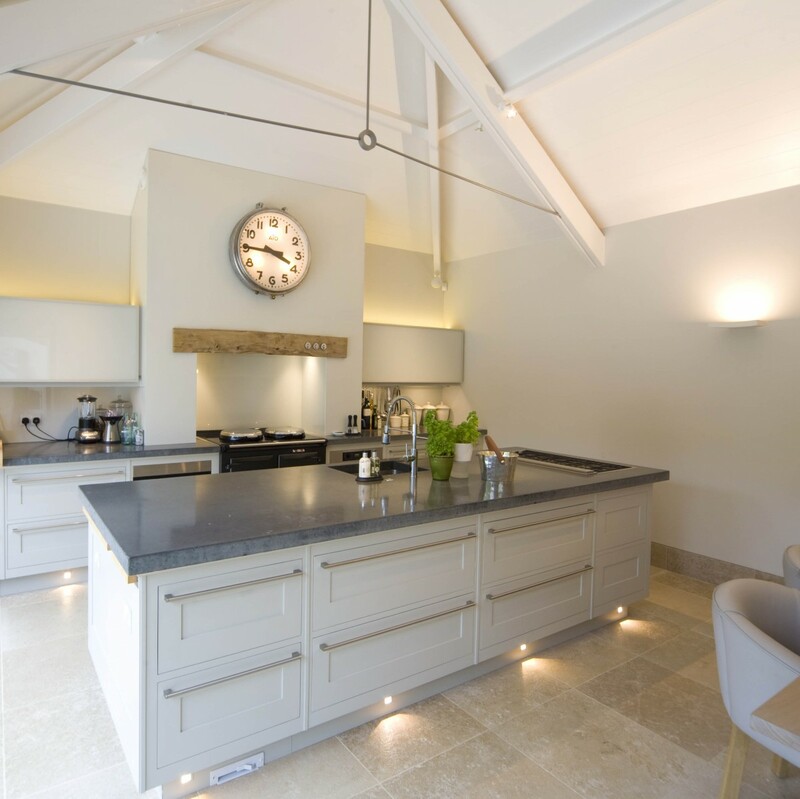 Instead halogen wall mounted uplights have been used combined with LED Lucca uplighting and task lighting as well as low level 1w LED Cazallas in the kitchen island plinth give a soft glow at night. A striking pendant hung low over the dining table, this creates a dramatic focal point and flowers are spotlight with beam mounted Minos 35 spotlights. The media room boasts the latest in audio visual equipment and is complemented by the use of discreet LED Contour shelf lighting and directional Polestar 2010 downlights accent the artwork and give reflected light to the space. Dimmable fluorescent wall lights give task light when reading. The guest suite, painted white for maximum reflection is simply lit with adjustable low glare Trimless downlights, Mesh Wall up/down lights and touch controlled fibre optic bedside reading lights. LED Lucca uplights behind the bath in the ensuite and downlights in the niche once again give mood to the simple interior. For an award winning lighting design for your property, please contact the Design Secretary on 020 7371 5400.